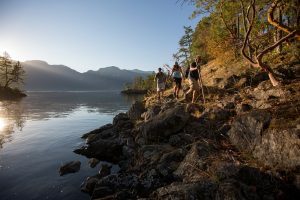 There are thousands of hiking trails in British Columbia, from the Rocky Mountains to the Pacific Coast, trails that lead to panoramic mountain-top views, tranquil lakes, and breathtaking waterfalls. British Columbia has a large variety of hikes for everyone of all fitness levels. Hiking trails are usually divided into two categories – day hikes and overnight hikes. Day hikes are trails that can be hiked from start to finish during daylight hours. There are many popular day hikes in major urban areas, such as Vancouver’s North Shore, Squamish, Whistler, Penticton and Victoria. Overnight hikes involve packing all your gear and camping overnight, anywhere from a single night to multi-day trips. The world famous West Coast Trail on the Pacific Coast of Vancouver Island is BC’s most famous multi-day trail as it takes an average hiker 7-days to complete the rugged route. BC Parks manages hundreds of trails throughout the Province and many of their parks have campsites with convenient access to popular trails. Access to BC Parks hiking trails are free, however camping fees and campsite reservations are required in many areas. There are thousands of back-country hiking trails that are much less maintained but managed by Recreation Sites and Trails BC. There are seven National Parks located in British Columbia that are managed by Parks Canada. Entry fees are required to use the hiking trails in these parks and additional camping fees and reservations apply, depending on the areas. There are many, many more hiking trails and parks that are managed by local and municipal governments throughout British Columbia. Exploring British Columbia’s natural beauty can easily be taken for granted if you do not take the proper safety precautions before heading out. Unfortunately, there are dozens of people who become lost while hiking each year in BC and some are never found. Taking the following precautions will help to ensure you have a safe hiking experience. Always tell someone where you are going and when you expect to be back. Leave as many details with this person as possible so if they don’t hear back from you at the agreed time, they know to notify the police. Knowing the details of where someone has hiked helps search authorities pinpoint areas to search. Never hike alone. The rugged and remote wilderness can easily lead to an injury with no help nearby, leaving you stranded and a long way from help. Be prepared for encounters with wild animals. Grizzly bears, black bears, and cougars are some of British Columbia’s larger animals that can pose a danger to humans. Check the weather conditions and other local information. Light – Pack a headlamp or flashlight with fully charged batteries in case you are on the trail after dark. Food and Water – Ensure you take the proper amount of food and water for your hike. Do not rely on clean water sources along the trail. Fire Starter – Pack waterproof matches so that you can start a fire to keep warm at night if you become stranded. Extra Clothes – Pack adequate clothing for the conditions and we wary that temperatures can change significantly at higher elevations or during nighttime. Pocketknife – A strong knife can be a useful tool for survival as it can be used for things like cutting small pieces of wood to start a fire. Shelter – Simple items like a reflective emergency blanket or garbage bag. Signaling Device – A whistle can be one of the most important devices to help attract attention so rescuers can find you. First Aid Kit – Bandages, wraps, items for blister control, and more can be important if you become injured while hiking. Navigation – A compass, map, and GPS are the most important navigational tools. DO NOT rely on your cell phone as many areas of BC do not have cell phone access due to the mountainous terrain, including areas that are a mere kilometer from major urban cities. Sun Protection – Sunscreen and a hat can help protect you against sun burns and sun stroke. Camping & RV in BC has a google map that shows where all the private campgrounds, provincial parks, national parks and recreation sites are and each listing indicates whether they are close to hiking trails. Read blogs on the Camping & RV in BC website that highlight some of our visitor’s favourite places to hike.